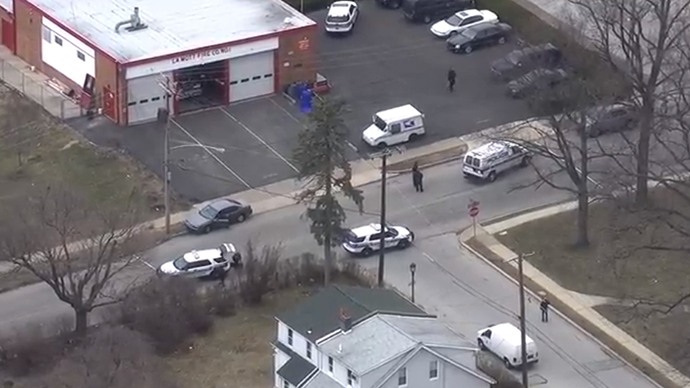 A hostage situation unfolded Tuesday morning in suburban Philadelphia, Pennsylvania after an armed man reportedly entered a local firehouse. Local media reported that the ordeal began unfolding at around 10:40 a.m. local time in the basement of the La Mott Fire Company in southeastern PA. The firehouse is in Cheltenham Township in Montgomery County, roughly 13 miles north of Philadelphia. According to a local Fox affiliate, an unnamed source said that three hostages were being held by an ex-firefighter as of 11:30 a.m. WPVI, an ABC News affiliate, said that local law enforcement officials confirmed that an armed subject was inside the fire station. A person was seen leaving the building at around 11:30, but it was not immediately clear how they were involved in the incident. A second person was detained around 15 minutes later outside the firehouse at gunpoint, and local media reported soon after that law enforcement had taken a suspect into custody. The La Mott Fire Company is one of five stations in Cheltenham, and close to at least two schools, a major shopping mall and several churches and apartment complexes, according to ABC. NBC10 reported just before 12 noon that police confirmed no injuries or fatalities at the scene.